Anyone with an MCommunity role as Student, Faculty, Staff, or Sponsored Affiliate can request an MPrint account for themselves, a single user, or a valid MCommunity group. Alumni and Retirees must first request access. A professor who wishes to fund printing for a group of students. An admin who wishes to fund user(s) in your department. 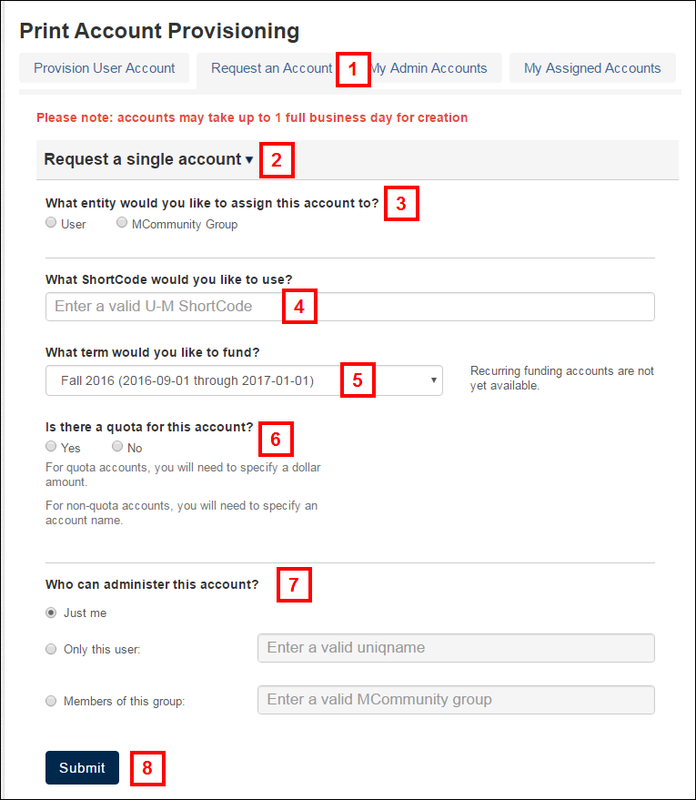 Select Request a single account. On the Print Account Provisioning page, select User or MCommunity Group for the first section and enter a uniqname or group name. Select an academic term from the drop-down menu. Note You may fund up to three academic terms. To fund additional terms, complete a separate request. To provide a quota for the account, click Yes and enter a whole dollar amount in the What is the quota for each user? field. Note(s) If you select No for quota, you must enter an account name. Accounts without a quota are auto-approved. Accounts with a quota require approval. Select an option for Who can administer this account. Just me if you are responsible for administering the account. Only this user if another individual will administer the account. Enter the uniqname. Members of this group if you want a group to administer the account. Enter the MCommunity group name. When the account is approved, an email notification is sent to all users assigned to the account, informing them that the account is active and available for use. To close an account, navigate to https://mprint.umich.edu/account/provisioning. Click My Admin Accounts. Click Admin next to the account you want to close. To view accounts that you are associated with, click My Assigned Accounts under Print Account Provisioning. A list of your accounts displays. To check your print account balance and usage statistics, log into the MPrint Account page. Some departments may wish to subsidize printing for a group of users with a quota, or with an unrestricted account. This requires a valid shortcode, and can be done via the online account provisioning application. If you have created a print account, administrators of the account will receive an email 20 days prior to account expiration, as well as the day prior. Follow the link in that email, or navigate to the admin page, select the account to renew, and click Renew Account. This tells the system to keep the account open for the next semester, and if it has a quota, to reset the quota to the initial amount. If you are interested in receiving reports on printing in your unit or for a group of users, please contact the ITS Service Center (4help@umich.edu or 734-647-HELP) to request reports.